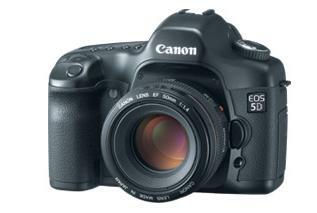 The Canon 5D is a semi-professional digital SLR camera. Because of the nature of the IR enabling modification, we do not recommend this camera to anyone who does not fully understand the implications of the modification. We stock and can modify this camera to be IR+Visible, IR-Only or Visible Hot Rod. An IR+Visible camera will see both Infrared and Visible light after modification. An IR-Only camera will only see IR from 715nm through 1200nm. The IR-Only camera has an internal 715nm IR filter with an antiflection coating. The 715nm filter performs similarly to the Hoya RM72 and Wratten 89B. Our IR-Only cameras include an adjustment to the Auto Focus so that the camera focuses in the infrared region. This means you can use whatever lens you prefer without worry about shooting a F8 or higher to get proper focus. However, since the AF will be focusing in the infrared, the visible focus will be slightly off. to the user looking through the lens. The Canon 5D has a full-frame sensor that allows the photoreceptors to gather more photons than the smaller sensors in other cameras. Because of this, the 5D has exception infrared and ultraviolet performance. If you need to gather has much light as possible, we recommend the 5D. 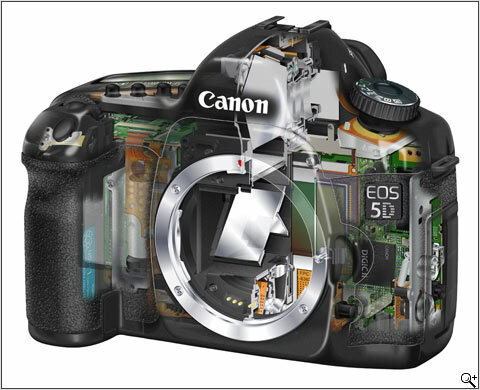 We can modify your Canon 5D or Canon 5D for a $450 fee + return shipping & handling ($20 for UPS ground insured within continental USA). 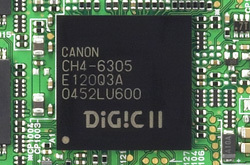 12.8 Megapixel full-frame CMOS Sensor. World's smallest and lightest full-frame digital SLR* with a 12.8 Megapixel CMOS Sensor and superb image quality. The EOS 5D's full-frame CMOS sensor records 4,368 x 2,912 pixels-that's 12.8 Megapixels, larger than many other companies' top-of-the-line sensors. The same size as a 35mm image on a traditional camera, the sensor operates without a conversion factor. This is perfect for taking advantage of the spectacular optics in Canon's L-series, and will be a joy for wide-angle enthusiasts who can make the most of their wide-angle lenses. 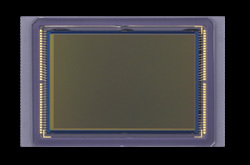 This new CMOS sensor, designed in-house by Canon, provides smooth, high-resolution images similar to the EOS-1Ds Mark II but in a more compact body. 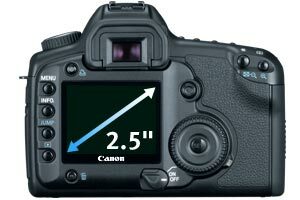 Two automatic noise reduction features maximize the effectiveness of the EOS 5D's on-chip noise reduction. Noise reduction can be activated when noise is detected or it will simply come into play on any exposure of 1 second or longer. * As of August 2005. Unprecedented performance and image quality. DIGIC II Image Processor for outstanding image quality and performance - 3.0 fps for up to 60 consecutive JPEG or 17 RAW frames in a burst. The EOS 5D's new 12.8 Megapixel sensor is driven by the revolutionary DIGIC II Image Processor for unprecedented performance and image quality. Thanks to the DIGIC II Image Processor, the EOS 5D is capable of shooting up to 3 frames-per-second for up to 60 JPEG or 17 RAW images. The information captured by the sensor is processed and assembled into images of exceptional clarity and resolution. Photographers can expect precise, natural colors, spot-on white balance and speed in any number of lighting situations. By handling larger volumes of image data, the DIGIC II Image Processor also contributes to lower power consumption: photographers will discover that they can shoot all day with the EOS 5D without having to change the battery! More information, view from almost any angle on a bigger LCD screen. New larger 2.5 inch LCD screen can be viewed even at extreme angles up to 170?. The EOS 5D has been designed to provide the photographer with instant feedback, saving valuable time when reviewing images. A new 2.5 inch LCD screen with approximately 230,000 pixels not only displays more information, it can be viewed at a far greater angle (170?) than many other conventional LCD screens. 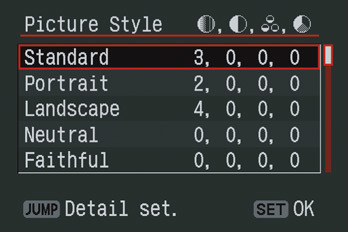 The full-featured shot information screen not only provides an RGB histogram, it displays the AF frames used. Magnification to check exposure and critical focus has never been faster. 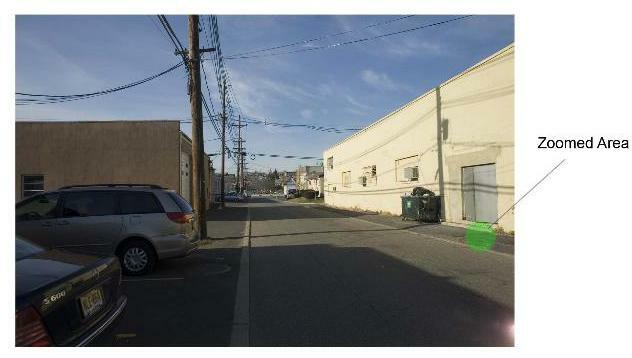 It is also simple to jump quickly in image intervals up to 100. Menus are accessed at the touch of a button, and feature larger, easier to read text than previous models. Whether changing color parameters, setting up custom functions, organizing folders, setting white balance, or any other feature, the new screen is designed with the professional in mind. Photographers get to their information quickly, so they never lose a shot. New "Picture Style" function for superior command of in-camera color, contrast and sharpness. "Picture Style" settings simulate the characteristics of different film styles, including Snapshot mode, for punchy, print-from-the-camera color, Portrait mode, for softer, more natural skin tones; Landscape, for vivid blues and greens and overall sharpness, plus Neutral, Faithful and Monochrome, which can be customized to emulate color filters with black and white film. Advanced 9-point AF with extra. 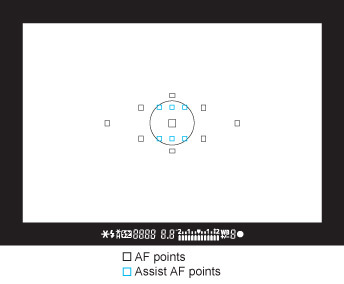 High-precision 9-point AF with 6 additional Supplemental points surrounding the center point for superior focus tracking. Strong and light magnesium-alloy body with new shutter durability-tested to 100,000 exposures. 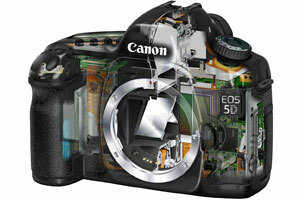 The EOS 5D has a solid and substantial feel that complements its compact dimensions. The camera body is constructed of a magnesium-alloy known for its lightweight and ultra-rigid strength. The EOS 5D also boasts a newly developed, high-speed and durable shutter unit that was designed to meet the demanding requirements of a full frame sensor in a relatively compact body. With a top shutter speed of 1/8000 sec. and with a remarkable 100,000-cycle shutter life, it truly is a camera built to professional standards. The EOS 5D is compatible with all Canon lenses in the EF lineup (except EF-S lenses), ranging from 14mm Ultra-Wide to 600mm Super Telephoto lenses. The EF lineup employs advanced optical know-how and sub-micron precision engineering to deliver unprecedented performance in all facets of the photographic process. Aspherical optics and Fluorite elements, for example, are featured in the universally acclaimed L-series Lenses while Canon's Image Stabilization feature minimizes the effect of camera shake. The EOS 5D features Canon's E-TTL II flash metering system introduced with the EOS-1D Mark II. E-TTL II provides consistently accurate flash exposure from shot to shot. Canon's Speedlite 580EX and 430EX are perfectly suited to the EOS 5D. They include an AF-assist Beam, which works in conjunction with the EOS 5D's focusing system, and automatically sends color temperature information to the camera when the flash fires, for more accurate color rendition with flash photography. 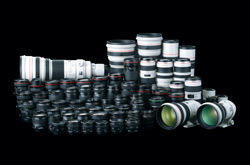 In addition to Canon's EF lenses and EX Speedlites, several other accessories are designed to work specifically with the EOS 5D. The Battery Grip BG-E4 adds a vertical shutter release, and is compatible with up to two of Canon's Lithium-ion battery packs, or alternatively a set of six AA-size batteries, for increased shooting capacity and greater convenience when traveling. 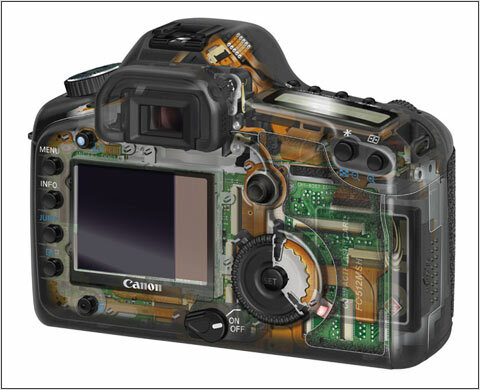 Canon's Data Verification DVK-E2 is an option for the EOS-1Ds Mark II, EOS-1D Mark II N, EOS 5D and EOS 20D. Like its predecessor, this kit can verify whether or not a photo is an untouched original. Its use of a Secure Mobile (SM) card reader, instead of an IC card reader, makes it more compact and affordable than the previous version.